LinWarrior targets to be a somewhat classical open source Mech-Sim/Game - a multiplatform open terrain combat and campain simulation game. LinWarrior is not exclusively bound to any specific classic title also its historic working title may suggest otherwise. Gameplay should not be FPS-like but it may still be arcade-like and surrealistic. The primary target of development is single player campaigns and not realistic graphics, physics or network play. But saying that graphics and physics are unwelcomed would be untrue - but even then physics is more desireable for a simulation game. New features may come in as time and program evolution flows - no fate. Abstractions of realism is what the small artist can compete with against the modern camera - metaphorically spoken. It implements the actual mecha-piloting or mission-game-play as a stand-alone-program. The Core is what's currently under development. Currently missions are hardcoded while features are still evolving. Eventually it will be filebased - so missions and components of mechs may be defined in files. Currently the Core is invoked by hand but will be called by a frontend lateron. The Core will return a result-value indicating mission success or failure. Bounty may be stored in a file. Like the Intermission-Frontend the Terra-Forming-Tool will provide a means to model and define Missions separated from the Simulation-Core to keep complexity low. Text and commandline tools could provide basic functionality. A Terra-Forming-GUI building on the simpler tools could provide a 2D eagle eye view on a map. There symbols indicating objects could be placed. A game specific frontend will provide higher level Campaigning, Financing, Investment, Trading, Customizing, Storytelling or RPG-ing which isn't covered by the Sim-Core itself. Since it is separated from the actual Core it may be implemented in any technology able to start another program. 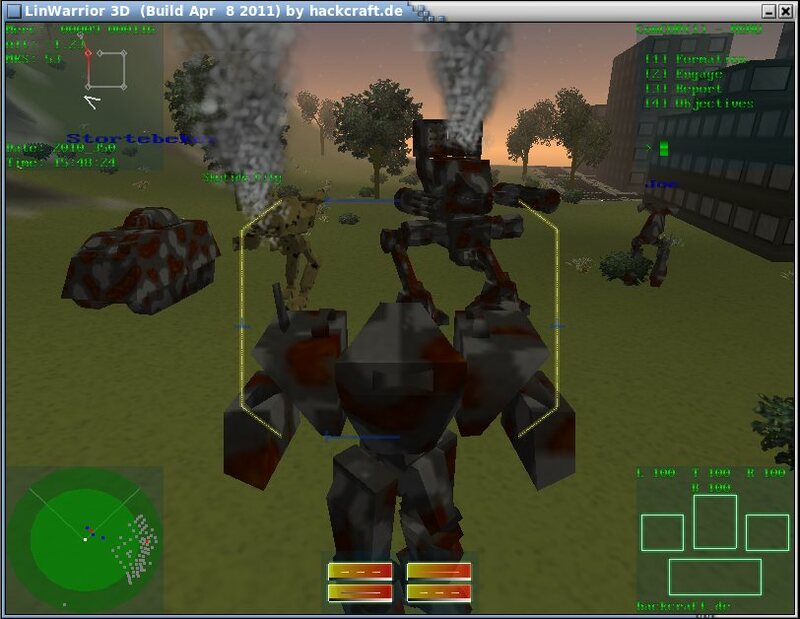 The Frontend provides or generates a mission file to the game-core which includes the player's, NPC's and opponent's mech-configurations. Most suitable would be a 2D-Frontend but it may be text-based, SDL, windowed, swing, html-browser - you name it! This may allow for a vast amount of mods based around different themes and stories.